Range of energy efficient LED lamps and bulbs in a variety of shapes and sizes, now including Dimmable lamps. LED lamps are the environmentally friendly lights of the future. 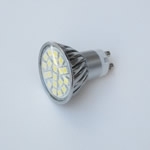 LED is low maintenance and typically have an average lifespan up to 50,000 hours.They use very little energy in comparison to their light output so makes them very economical to run and cool to touch, Samples available on request.